Yale University Press, 9780300211979, 400pp. The Sonderkommando of Auschwitz-Birkenau consisted primarily of Jewish prisoners forced by the Germans to facilitate the mass extermination. Though never involved in the killing itself, they were compelled to be “members of staff” of the Nazi death-factory. This book, translated for the first time into English from its original Hebrew, consists of interviews with the very few surviving men who witnessed at first hand the unparalleled horror of the Auschwitz-Birkenau death camp. Some of these men had never spoken of their experiences before. 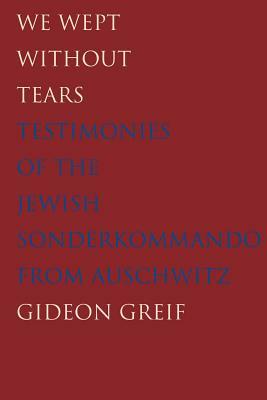 Over a period of years, Gideon Greif interviewed intensively all Sonderkommando survivors living in Israel. They describe not only the details of the German-Nazi killing program but also the moral and human challenges they faced. The book provides direct testimony about the “Final Solution of the Jewish Problem,” but it is also a unique document on the boundless cruelty and deceit practiced by the Germans. It documents the helplessness and powerlessness of the one-and-a-half million people, 90 percent of them Jews, who were brutally murdered in the gas chambers of Auschwitz-Birkenau.